Posted on June 19, 2015 . Oh my… I just adore those bright fresh summer colours! They instantly lift your mood, don’t they? I can’t get enough of those gorgeous pinks, corals and fuchsias on both my lips & nails. But let’s talk only lipsticks today and my most worn shades I’m having on rotation these days. The sheer red – Lipstick Queen in ‘Aloha’ is the perfect shade when you want to wear red lips but you either can’t be bothered with the super precise application or you’re not comfortable with wearing a full on red. Of course reds are trendy every season but Aloha looks so juicy it just screams summer. It also feels absolutely weightless and leaves an even, gorgeous stain. The sheer pink – The Body Shop Colour Crush Shine in ’15 Fuchsia Flirt’ is another sheer, almost gel-like lipstick that melts into the lips and leaves a fresh looking wash of pink. It can also be layered to achieve an impressive opacity (as on the swatch) and has a very shiny finish. The staying power is not great but I don’t really care as I can easily reapply it even without a mirror. The raspberry pink - Clinique Pop Lip Colour + Primer in ‘Punch Pop’, my most recent lipstick purchase, was love at first application. It’s a typical me colour – bright, a bit darker pink that looks lovely on my fair complexion. As the name suggests, the formula contains a smoothing primer that helps the lipstick glide over lip imperfection for a very nice, even finish and the staying power is awesome. So these are the colours I’ve been wearing almost non stop for the last couple of weeks. 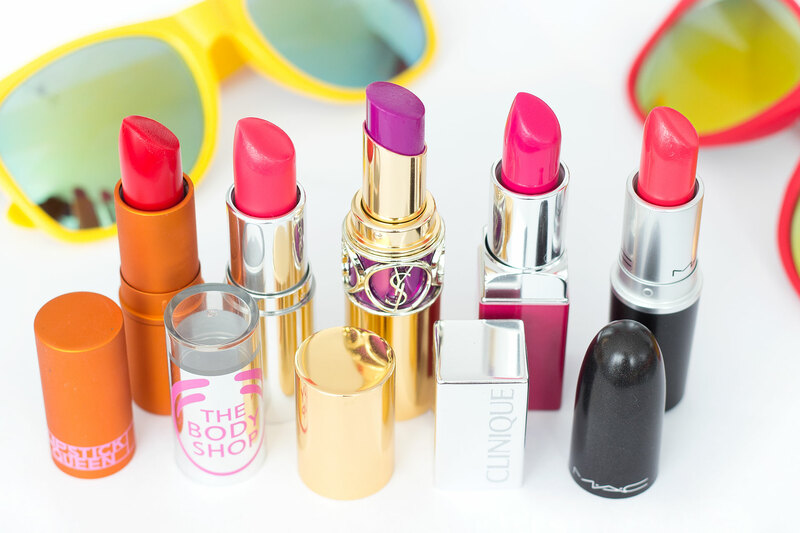 And what are your favourite lipstick shades for hot months? Any I NEED to try? Your photography is always gorgeous, love the lip product photo! 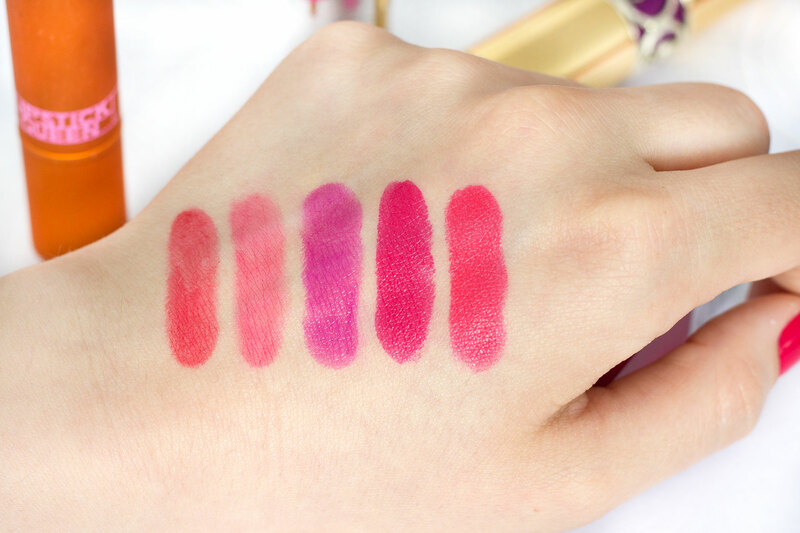 The Body Shop lip shade look adorable! One more I’d add to this line up would probably be a simple Baby Lips by Maybelline – the pink one in orange tube is my essential for summer Have you used it? If so – do you like it?